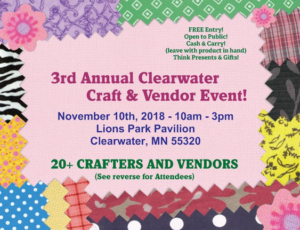 I’ll be joining this group again at the Clearwater, Minnesota, Lions Park Pavilion on November 10 from 10-3. I’ll be bringing all my books and offering some great deals. They make awesome birthday, Christmas, and Hanukkah gifts. Krista says I’ll be in the first room you enter…easy to find me. I have a couple upcoming private book club visits. Unfortunately, no major snow bird trips this year as, ugh, I have a visit at the St. Cloud Hospital with my orthopedic surgeon for knee replacement. That will put me out of commission over the holidays and for a few weeks after. I’ll return for a major speaking event with the St. Cloud League of Women Voters. I’ll bring Jennie Phillips and Maude Porter to life as I discuss their need for suffrage. 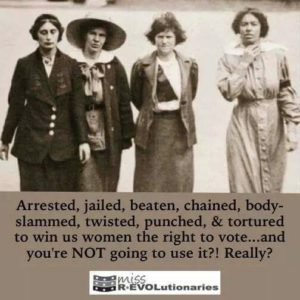 Throughout these suspense novels, both protagonists in Pins & Needles and Scruples & Drams express this need for women’s vote. During my convalescence, I can always mail books though if you miss seeing me at any of my upcoming events. Don’t forget to vote November 6.